When it comes to watch design, there is perhaps no name better known than that of Gerald Genta. And for good reason. The Swiss-born designer is responsible for some of the industry’s most iconic and long-lasting designs–among them the Royal Oak (which he famously claims to have created overnight), the Nautilus, and the Ingenieur SL. But beyond his best-known designs, Genta has also led an illustrious career quietly contributing to the portfolios of countless firms, injecting his unique design language into watches from the likes of Rolex, Omega, Seiko, Benrus, Hamilton, and even Timex. One of Genta’s most stunning contributions to watch design is also one of his earliest, occurring nearly two decades before his work with Audemars Piguet and Patek Philippe. As the story goes, in 1954, Universal Genève tapped Genta–then just 23-years old–to design a watch to commemorate SAS’s (Scandanavian Airlines Systems) polar flights from New York/Los Angeles directly to Europe. 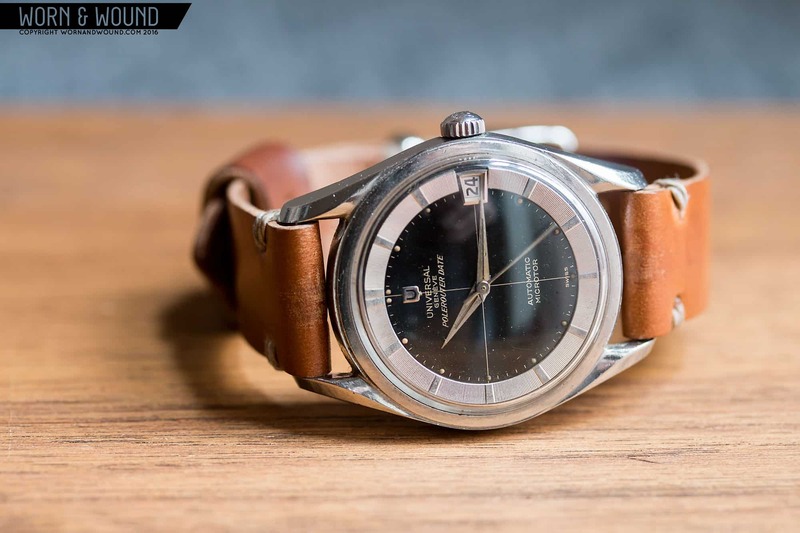 That watch would come to be known as the Polarouter–later renamed to Polerouter–and it would spawn a highly successful family of watches for Universal Genève. Today, we’re going to take a closer look at the origins and history of the Pola/Polerouter line–a line that to this day remains increasingly popular with collectors. But flying over the North Pole came with a new and serious problem–magnetism. For starters, SAS had to develop an entirely new navigation system to overcome the extreme magnetic fields found on the Poles. The other issue was timekeeping. Flying over the North Pole wreaked havoc on timing instruments, including the wristwatches worn by the pilots and crew. Universal Genève was SAS’s official supplier of watches, with the firm being chosen specifically for their work with anti-magnetic timepieces. 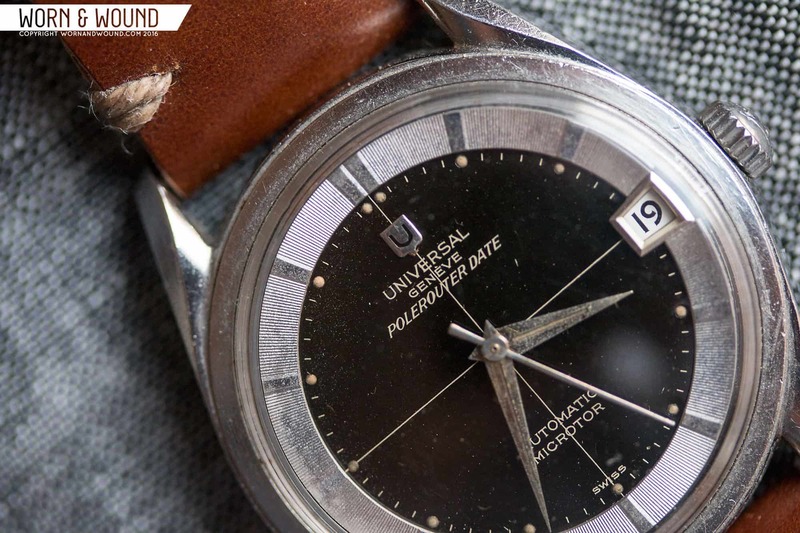 To commemorate the historic Copenhagen-Los Angeles flight, Universal Genève brought in Gerald Genta, a relative unknown at the time, to design a watch that would be given to SAS as the airline’s official pilot’s watch. Genta’s submission was aptly named the Polarouter. The first of these were appropriately given to the crew upon landing in LAX, and featured the SAS logo on the dial. It is believed the only several hundred of these were ever issued. The Polarouter was officially released in 1954. That initial design, with a 34.5mm case boasting gorgeous bombé lugs and a dateless dial featuring a textured inner index ring, would become the foundation for the series, with later models taking certain liberties on that core design. A year later the line was renamed Polerouter, but beyond the name change the watches retained much of the original look. Up until around 1969, Universal Genève continued producing variations under the Polerouter line, among them the Polerouter Jet, Polerouter de luxe, Polerouter Super, Polerouter Genève, Polerouter Compact, Polerouter Day-Date Polerouter “NS”, Polerouter III, and the Polerouter Sub. Polarouters (as well as some early Polerouters) were fitted with the same Cal 138 SS bumper movements (introduced in 1948) found in earlier SAS watches. In 1955, Universal Genève equipped the Polerouter with their new 215 micro-rotor movement, one of the first of its kind (the other being Hamilton/Buren’s “planetary” rotor found in their Thin-O-Matic range). Though the revolutionary 215 was first introduced in 1955, Universal Genève was not able to patent the movement until 1958 due to a legal dispute with Buren. As a result, early 215s were signed “Patented Rights Pending” underneath the rotor. The 215 was followed by the 218, which featured some basic improvements on its predecessor, particularly with regard to the fine adjustment. The 218-2 was most common across the Polerouter Date range. In 1962, Universal Genève introduced what are perhaps the two best-known iterations of their micro-rotor system, the cal. 68 and 69. These two calibers underwent many improvements, including a “stop oil” chemical treatment that prevents oils from shifting and ultimately reduces the frequency of overhauls. They also featured an impressive 55-hour power reserve. The cal. 69 was commonly found in the Polerouter Sub and Super models. Aside from the some of the earlier Pola/Polerouters, the date variants remain immensely popular amongst collectors. The trapezoidal date window is a beautiful and underutilized touch, as is the wonderfully playful font on the date wheel. Original crystals came with magnifiers matching the shape of the date window and are often very hard to find, so consider yourself lucky if you manage to snag one. The Sub is also another popular one with collectors, produced by Universal Genève from 1961 to about 1968. There are two primary versions of this model: the earlier (and rarer) EPSA-made dual crown Super Compressor, and the later single crown model (as can be seen here). While the single crown versions are relatively common today, the Super Compressor variants are incredibly hard to find in good, let alone original condition, and unfortunately it is a watch that is often faked. There are two executions of the Super Compressor variant. The earlier take features a case with curved lugs, fine lettering on the bezel, and small lume dots positioned within the hour markers. The later variant features a slightly different case with straight beveled lugs, thicker printing, and fully lumed markers. The earlier execution is by far one of the rarest watches within the Polerouter family. Throughout its run, the Polerouter was positioned as a high-end watch in Universal Genève’s catalogue. To put things into perspective, in the late 1950s a steel Polerouter was priced the same as a Rolex Explorer. Despite ending its initial run in 1969, the Polerouter made an unsuccessful return in the late 80s and early 90s with some ill-received quartz models that never quite went anywhere. Today, vintage models can be found quite easily, though perhaps not in the same abundance as just a few years ago. Nevertheless, the Universal Geneve Polerouter remains one of the most desired and still affordable of Genta’s designs.